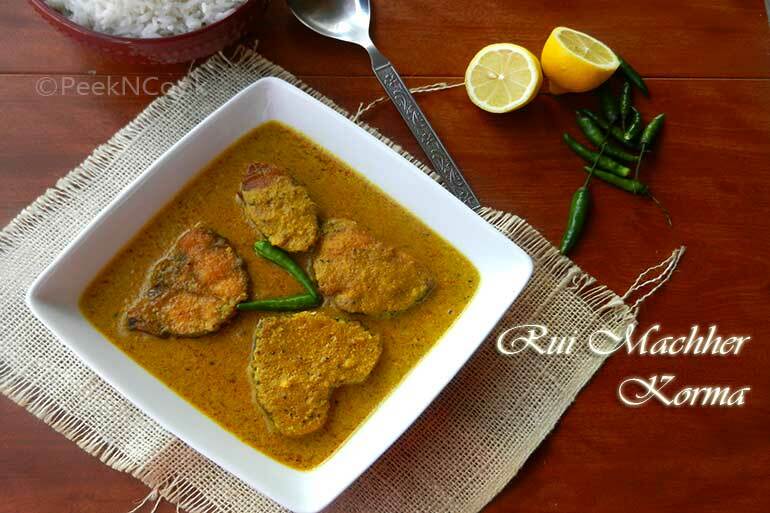 This is a very different kind of Rui fish recipe with creamy yogurt based gravy. Poppy seeds and cashew are used in this gravy. Make a fine paste with onion, green chili & ginger and keep into another bowl for further use. Make another paste with poppy seeds, cashew, mouri, cumin seeds, kismis and keep this paste too aside for further use. This poppy seeds paste can be made dry or wet. Take the curd in a bowl and beat well with a fork, and the curd should be at the room temperature. Otherwise the curd can be curdled when you add it to the pan. Clean and wash the fish pieces, pat dry them and put into a plate. Sprinkle salt and turmeric powder on the pieces and rub with the fish pieces and keep aside. Heat vegetable oil in a non-stick pan. Add the fish to the hot oil and fry them till golden brown on both sides. Take the fried fish out of the pan and put into a bowl. In the same oil, add 1 or 2 tablespoons of Vegetable oil if needed. Add cinnamon, cardamom, cloves, bay leaf to the oil and fry the whole spices till a nice mild aroma comes from the spices. Add methi & radhuni to the oil. Add the onion paste to the pan & fry till the paste becomes lightly brown & oil oozes from the mixture. Now add the poppy seed & other spices paste to the pan and fry again for 3 to 4 minutes. Sprinkle some water while frying to prevent the masala get burnt from the bottom. Add turmeric, kashmiri red chili powder to the pan and fry with the masala. Now add the beaten curd to the pan. Add the fried fish pieces and 1 cup of warm water the the pan. Adjust salt and sugar. Cover the pan and let the gravy boil for 5 minutes on medium heat. Open the cover, turn off the heat, sprinkle ghee & garam masala powder on the Korma and serve with plain rice. You may granish the korma with green chilies. If you like this recipe, then go to my Facebook Page and like my page for regular updates.